The basic role of supplements and nutrition packaging is to provide content protection and containment. Supplements and nutrients are gaining speedy growth on the back of increasing global aging population and rising fitness and amateur athletes’ population. Supplements and nutrients include vitamins, minerals, proteins, fatty acids, herbs, amino acids, fibers and more required for supplementing sufficient nutrients that are not absorbed in a regular diet. Products for nutritional supplements come in form of soft gels, tablets, gummies, capsules, powders and liquids. Packaging for supplements and nutrients can be done in generic bottles and blisters packs. Supplements and nutrition packaging provide shelf impact in a range of similar products along with brands unique identity. In a competitively crowded market, packaging provides major influence in purchasing decisions of the consumer. Thus, the selection of packaging format is an essential step in the end user and marketplace competition. Market players in the recent past have incorporated custom designed packaging to differentiate products beyond label graphics and bottle colors. Additionally, packaging requirements for geriatric population utilization suggest the need for easy to open and easy to read senior friendly packaging. These factors together are anticipated to propel the supplements and nutrition packaging market over the forecast period. 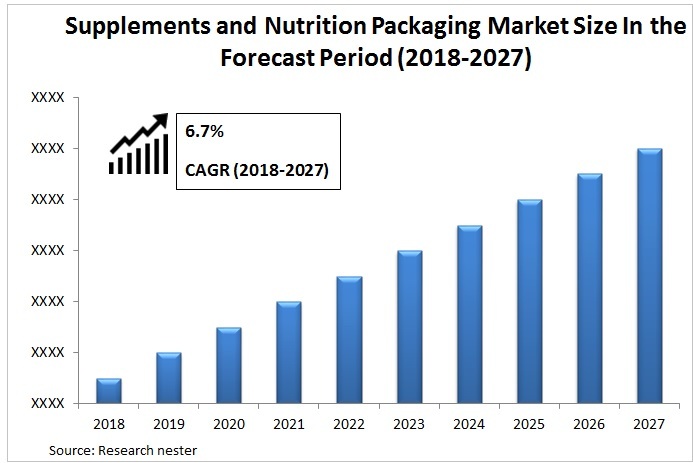 Supplements and nutrition packaging market is anticipated to record a CAGR of 6.7% over the forecast period. Supplements and nutrition packaging is expected to reach the value of USD 17 billion at the end of the forecast period. Many multi-national companies are concentrating towards new product advances in supplements and nutrition packaging. Moreover, the many advantageous properties of supplements and nutrition packaging are exploited in the field of pharmaceuticals and food now and then which is expected to drive the supplements and nutrition packaging market rapidly. Currently the global supplements and nutrition packaging market is observing vibrant growth owing to increasing health awareness in the present population. Advances in healthcare industry in the past few years and growing fitness trends are projected to drive supplements and nutrition packaging market besides the wide range of functions of supplements and nutrition packaging in every range of population from geriatric and middle age to adolescent and children during the forecast period.On the basis of regional platform, global Supplements and Nutrition Packaging market is segmented into five major regions including North America, Europe, Asia Pacific, Latin America and Middle East & Africa region. With a developed healthcare sector high fitness based adolescent populated region, North America is panned to observe substantial supplements and nutrition packaging market growth on account of rising supplements and nutrition packaging usage among the geriatric population taking supplements. North America is expected to be followed by Asia Pacific in terms of consumption due to expanding supplements and nutrition packaging requirements in amateur athletes’ population taking protein supplements. On the back of multiplying supplements and nutrition packaging uses in growing fitness oriented industries, Asia Pacific is budding as a regional supplements and nutrition packaging consumption market. The rising demand for Supplements and Nutrition Packaging and its by-products for various processes in pharmaceutical and food supplement industries are expected to drive the market rapidly over the forecast period. Rapid urbanization with increasing economic development and rise in disposable income is expected to boost the supplements and nutrition packaging market in the developing regions across the globe. Application of supplements packaging in providing freshness protection, tamper evidence, business to consumer communication and re-closure is anticipated to contribute appreciably to the supplements and nutrition packaging market across the globe. Moreover, packaging provides anti-counterfeiting measures, compliance, administration aids and product branding with unique custom designs that make an impact on the shelf which is attributed to drive the supplements and nutrition packaging market robustly. Packaging with competitive distinction and reduced expenditure will benefit consumers as well which is estimated to drive the market significantly over the forecast period. However, customization in packaging products lead to increase in the price of the overall product to other competitive products resulting in lower adoption by the middle-income population of the customized packaged products over the forecast period.